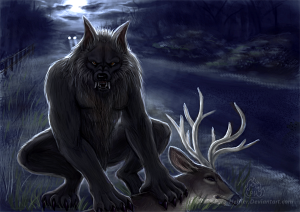 A hairy humanoid with canine features, the Beast of Bray Road, has been sighted in Wisconsin dating back to 1936 on a rural road outside of Elkhorn, Wisconsin. More recent sightings in the 1980s and 1990s, place the creature in Racine, Walworth and Jefferson Counties. Those who have seen the beast describe him as eating or hunting/scavenging. Also known as Manwolf, Bear-Wolf and Indigenous Dogman it is said to be around six feet tall with gray and brown fur. Its face resembles that of a wolf, with shiny yellow eyes and pointed ears. Its body, though furry, looks like a muscular man. The creature is said to run and walk on all four of its legs or just its hind legs and has been spied sitting on its haunches and kneeling like a man. Some people believe it is a werewolf, others that it is a Bigfoot and, and some believe that it is a yet unidentified species. Though it has never attacked anyone, some witnesses claim that it has acted aggressively, running at them and jumping on their vehicles. Some researchers consider the Beast of Bray Road to be identical to a kind of Wisconsin Bigfoot that locals call the “Bluff Monster” or the “Eddy.” Others, including many Native Americans, believe it to be the “Wendigo,” which has often been spied in Minnesota. Others believe that it has simply been misidentified and is a wolf, a bear, or a large feral dog. This werewolf-like creature has been portrayed regularly in the media since the first sightings and even had a low-budget movie based on its legend. The number of sightings in the late 1980s and early 1990s prompted a local newspaper, the Walworth County Week, to assign reporter Linda Godfrey to cover the story. Initially, she was skeptical, but soon became convinced of its authenticity and later wrote a book titled The Beast of Bray Road: Tailing Wisconsin’s Werewolf. Does nobody in Wisconsin carry a camera?… or a gun? As much as I enjoy the unknown and a sense of mystery and discovery, this ain’t any different than nessy, bigfoot or unicorns. If it was, by now we’d have solid evidence. Sorry if I ruint a good story.